This year, we were joined by 25 delegates from around the world for a week of intensive study, hands-on demonstration – and a bit of fun. New for the Winter School in 2016 was a high-level, 2 day Executive Track; providing an overview of quantum technologies – including the latest innovations in quantum computing and cryptography. The detailed Technical Track lasted a full week and was packed with content; ranging from abstract security proofs to practical applications – including commercial quantum key distribution (QKD) – and hands-on demo sessions. It wasn’t all work and no play. Our delegates had plenty of opportunity to socialise and enjoy the best of what the Swiss Alps had to offer. 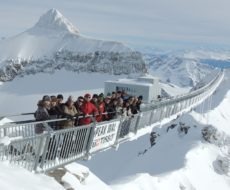 The social programme included an afternoon on the slopes, a moonlit downhill sledge event and a fabulous cable-car trip, 10,00 feet to the top of a glacier. Throughout the entire week, delegates enjoyed a thorough introduction to the world of quantum technologies. And cheese. Lots of cheese! If you missed out on this year’s school, stay tuned. We’ll be doing it all again next year.